The best parent child relationship is good for the parents as well as the children. Your child is learning more from watching you than from listening to you. When you show your child an example of a happy, healthy adult, you are actually doing some of the most important parenting you can possibly do. Who and how you are as a person is a powerful influence on your child -- just as powerful as what you say and do as a parent. You are giving your children a preview of adulthood, by your level of joy, satisfaction and fulfillment. Children look to their parents to find out what it's like to be a grown up, and if they see a harried, stressed, overworked example, they will not be too thrilled about moving into the next stage of their development. The good news here is that your primary job as a parent is to be a happy, healthy person. You certainly win in that deal, and your children do as well. Parenting skills are important, and we'll cover those as well. But now we will emphasize and explore what it means to be a happy person and a great parent at the same time. To create a healthy, happy parent child relationship, you must create meaning and fulfillment in your life apart from your children. I know, that may sound shocking, since many parents get their meaning and fulfillment through their children, but if this is how you see things, you're not doing your children any favors. When you associate your children with your life purpose, meaning and fulfillment, you're asking too much of them. Their job is to find their own unique purpose and self expression, not to fulfill your needs. You are showing them a picture of adult life that is attractive, something they will want to emulate and aspire to. You ask less of them emotionally, when you are finding joy and fulfillment in your own life apart from them. Believe me, they do not want to be the only or primary source of your happiness. As a happy, healthy, fulfilled person, you will be more patient and even-tempered with them. You will offer more of a relaxed acceptance of who and how they are. You will set them free from the burden of being responsible for your happiness. They want you to be happy, but they don't want to be responsible for it. Indirectly, you're sending a message that goes something like, "Being an adult is fun. You can do it too, and here's an example of how it can be done." This might bring up concerns about neglecting your children, as you're busy about creating your own happiness apart from them. I understand that concern, and this has nothing to do with neglecting your children's needs. Hang in with me, and I think you'll see where this is going and how it can lead you to the best possible approach to a happy, healthy parent child relationship. Your marriage is the foundation of your family. 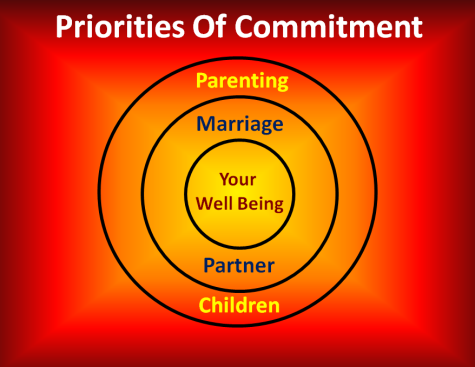 When you attend to your marriage, you are attending to the emotional foundation and well being of your children. In the chart above, you can see that your well being is the heart of your marriage, and your top priority. This greatly enhances what you bring to your marriage, which is the foundation for your parent child relationship. As your children form their sense of self and identity, one of the primary places they look is to your marriage. Not only to you, and to your spouse as individuals, but to the quality of your marriage relationship. Your children sense at a subconscious level that their existence emerges from the union between you and your spouse. Their feeling of security, comfort and safety in the world comes in large part from the level of connection and love they sense in their parents' marriage. You are showing a very up close and personal example of partnership and marriage, which will affect them profoundly in their adult life and choices. The tricky part is that you can't just have a happy marriage for the sake of your children. You already know that...it has to be truly happy. Just like your focus on your own personal joy and fulfillment, your focus on your marriage happiness is done for its own sake, not for the sake of the children. If your love for your spouse is not authentic and real, your children will see right through the facade. They don't miss a thing. You win because a good marriage is extremely beneficial to you, regardless. Your spouse wins because s/he does not get pushed aside because of your parent child relationship. Your children win because they get to see their parents in a healthy love relationship, providing them with a steady and firm foundation for launching into adult relationships of their own when that time comes. Now let's look at the beauty, magic and mystery of your children, and how you can bring the joy of who you are to their lives. "The shape of each soul is different. There is a secret destiny for each person." It is not your job to mold and shape your child. Your job as parent is to find, focus on and celebrate the uniquely positive qualities of your child. Your child is not born to fulfill your expectations. Your child is born to offer her one-of-a-kind gifts to the world. The more you encourage, support and gently guide your child, the sooner s/he will realize that unique purpose and bring it into fulfillment. Every child has special qualities, talents and propensities that set him apart from others. Your job as parent is to find, focus on and encourage the development of those. 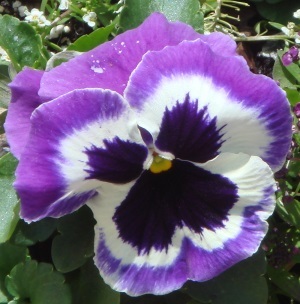 Think of the flower, and how the petals surround and protect the stamen through the dark and cold times, while opening and releasing when the time is right. This is the job of the loving parent in a happy parent child relationship. To be seen, acknowledged and welcomed into the family and the world. To be respected as a totally unique individual with special gifts and talents all her own. To be touched, held and played with in healthy ways. To be encouraged and supported in all of her efforts, passions and joys, however small or large. To be guided and taught about sexuality, romance and friendship. To be guided and taught about money and financial intelligence. To be guided and encouraged in the development of their own spiritual values and belief systems. Your children are self-directing, self-correcting beings. Trust their choices and preferences, while providing the necessary support and guidance in your parent child relationship, and you will see them flourish and thrive as they become the amazing person they were born to be. Boundaries and limits are essential to happy parenting and happy children. You can help your children with these limits, when you set them with love and wisdom. Keep in mind that parenting is one of our greatest challenges as human beings, and when you make up your mind to do it with love and a focus on yours and your child's happiness, you will be much more likely to succeed in the short term and the long term. Remember, when you and your child are in a state of happiness, you are healthier and more intelligent. And when you're connecting with the natural condition of joy that is in the core of your being, you are kinder and more compassionate with everyone you meet. Decide right now that you're going to focus on bringing the very best of who you are to your parent child relationship. 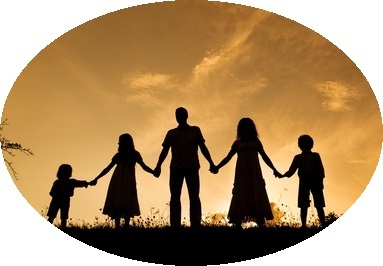 Positive Parenting -- Learn about balancing the many different aspects of parent child relationship, in your process of learning all that you can so that you can trust yourself to be a great parent. Parenting Help -- This is where you can give and receive parenting advice, read other parents' stories, and ask any questions you like. Get involved now, to help and be helped.